Jessyka Allen had a good life, until it wasn't anymore. Finding herself in an impossible situation, with no noticeable way out, her job was an escape. Working at the small bar and grill put her in contact with some wonderful people, who Jess figured couldn't ever understand what she was going through. So different but so good!! Oh how I loved this story. This one stand-alone is a perfect blend of friends to lovers and military romance. Kason “Benny” Sawyer knew there was something going on with Jessyka. Jess has been their waitress at Aces for years so he could tell something wasn’t right. When he goes to check on her one night he learns more than he bargains for. Jessyka was in a bad place feeling trapped in a situation. She needed a friend and Kason became that friend. As things develop between them, feelings develop and they become more than friends. He becomes her anchor as she becomes his everything. This book has the usual action and suspense that Susan Stoker is known for but it also has a bit of twist. What made the experience of listening to Protecting Jessyka the most enjoyable? I love this series but I'm glad I waited to finish the series till I could get the last few books on audio. I know this may seem weird to some but I started this series by listening to it on audio and really wanted to finish it that way so I had to wait a bit to finish. Susan did not disappoint me at all and this has become one of my favorites of her's that I've read. With every book I've become more and more in love with this family/team she has created for this series. They may have started as a team but along the way they have become a family. I love how Jessyka had to protect Bennie and although she didn't like what she had to do she did it anyways to save her man. The narrator Susan uses for this series does an outstanding job and when I'm listening to the man's voice in the story I never think that is a women talking like a man I just think how much I'm enjoying this book. I read this book when it was first released and loved it. The audio gave me a chance to dive back into a familiar favorite. Bloom is a wonderful narrator so she made this a delightful reread for me! One Massive Defect destroyed the story! I have enjoyed the series even though it is over the top, filled with high school mentality overly possessive alpha-male heroes, tough but battered females who fall in perfect love (with multiple orgasims every hour) and bad guys that are the lowest of the low! The storylines are a bit far-fetched but keeps you rooting for the main characters. Certain portions with make you laugh, shout out, tear up or get a bit excited! All the major characters in this series are great and learn to work together, gain trust, risk it all and become family! Why two stars for what is a 4.5 star series? Without giving away anything, a Seal will never ignore his training or rush into a situation without obtaining Intel first... especially when members of his team are at the given location! I almost stopped listening at that point but decided to finish! Susan, please find a different way for the bad guys to gain control other than the soldiers blatantly ignoring the most basic part of their training. You obviously have an amazing amount of love and respect for the military which is one of the reasons that I love your novels. As a former Marine, it means a lot to me! 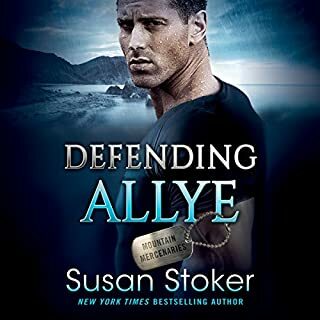 If you like military hero romance novels, Susan is a great author to read. 30 seconds of this book knocked it from 5 stars to 2 stars! I really like these stories but can't stand the whiny narrator!! I have tried & tried to listen to them but can't because is the female narrator! Would you listen to Protecting Jessyka again? Why? I would. This story had a tiny bit of a different spin with the others. It also showed the good guys didn't always follow the good guy rules with civilians. Also, it wasn't instant attraction. The team had been around Jessyka for a long time and it when it became clear she needed help did one step up to help her. She is a very good narrator and her voice inflection really helps the feeling of the story. I enjoyed this book like all the others and it was nice to see one of the team's women had a physical disability that didn't help her appearance but would have made any other man think twice. Disabilities on women aren't usually front and center - she was a real character, not a runway model. Loving this series. Totally worth the credit. Lots of action and great romance. Stoker's leads are smart, sassy women and hot sweet alpha males. Seals are always hot, but there's nothing like a hard as nails, take charge woman. Jessyka, despite physical disabilities was smart and used those sharp wits to save herself and her man from a psycho. Don't miss her story. Another great Stoker SEAL of Protection book. I highly recommend listening to the books in order. You'll have to read/ listen to Protecting the Future to finally learn the source of Benny's nickname. I love the story, the characters, but too much bedroom for me. ( yes it said it before I got it) I fast forward past that part. But I also cried because the book was that good. I would love to see more books like this, and love the story line. Great book Susan. I loved the people in this book. I love 💘 reading 📚 books about seal men. I need some Protection in my life. I can't wait to read more books by Susan in the near future. Other great book to listen to on audio , and read. Every book in this series is captivating and have unexpected twists. Well written and well read as well. thoroughly enjoyed this book. The characters are so likeable and also a different twist to this book from the others in this series.